Fresh Italian Multistradas on their way. Ducati has given a preview of its highly-anticipated 2013 range by revealing exciting new Multistrada models that introduce new features such as enhanced aesthetics, a second generation Testastretta 11° engine, the very latest ABS and, on the “S” versions, the innovative semi-active suspension system, Ducati Skyhook Suspension (DSS). The Multistrada’s award-winning Sport, Touring, Urban and Enduro electronic Riding Modes enable a truly enjoyable and customisable riding experience separated by just one click of a button. The four-bikes-in-one concept makes instant adjustment to power and torque delivery in addition to electronic adjustment of suspension settings, traction control, and now ABS and Ducati Skyhook Suspension, instantly transforming the Multistrada 1200 to suit its rider and environment with even more precision. Hailed as a true ‘game-changing’ motorcycle, Ducati’s Multistrada 1200 has attracted all types of riders to the Italian brand by removing the borders between different motorcycle categories and creating a model that is not only powerful and playful, but also a comfortable and versatile adventure on two wheels. The eight-level DTC and new three-level ABS introduce the Ducati Safety Pack (DSP) concept to the Multistrada family, further underlining Ducati’s focus on performance safety. Ducati’s Multistrada 1200 International Press Test is set to take place in Bilbao, Spain from 20-27 September, while the first public showing of the 2013 Multistrada range will be at the INTERMOT motorcycle show in Cologne, Germany from 3-7 October. 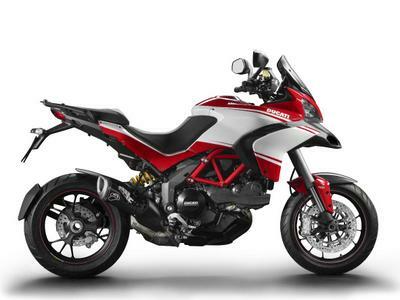 The brand new Multistrada 1200 models will be available via the official Ducati dealer network from January 2013.